The car is becoming an important need for these days as we depend on it pretty much every day. Without it, you can not go to work, get the kids to school, shopping, and so on. To run your car smoothly its tires should be perfect. Your tires are essential to your car to transport you from one place to another. We have a new device for all the car owner i.e Air Hawk. Air Hawk is an automatic cordless handheld compressor which is designed to inflate tires, sporting equipment and much more in just a few seconds! In this Air Hawk Review article, we will discuss every important thing related to it. The device pulls in air from outside environment and then compresses it in the tire. Using Air Hawk is really very easy, quick and exceptionally convenient. Air compressors can be a useful device in just about every aspect of life. Most of the air compressors use a reciprocating piston to generate a temporary vacuum, which pushes to open a valve that allows entering a small amount of air into a holding tank. The more strokes the piston will perform, the more air enters into the tank, where it is stored under pressure. And when this pressure is released, the energy it contains can be efficiently used to power tools, air up your tires, and much more. Is this Air Hawk is air compressor? After taking a look at its images, it seems that Air Hawk does not come with any type of holding tank. Instead, it’s simply pulling the outside air and forcing it into whatever’s needed. Air Hawk is a cordless air compressor. The device is multipurpose use. You can use it to inflate balls, car tires, bike tires, toys, and much more. It comes with 3-nozzles which enabled it to inflate anything. 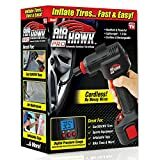 Although Air Hawk may not work like a standard air compressor, but it is perfect if you need to add some air to your car’s tires and pump up a bicycle tire. And because it is a battery-operated device, you should not expect it to be as powerful and fast, as a standard air compressor. For most of the users, its size, portability, and convenience probably make it a worth buy. I found that it generally took about 6-7 minutes to inflate a tire. When I tried this device I was able to inflate two almost flat tires on a single charge, in approx 12 minutes. The battery lasts around 15 minutes per charge and it takes near about 3 hours to get it full recharge. Air Hawk is not a single product of its type. looks very close to Air Hawk in design Also, the price of the product is less than Air Hawk. Hence, the IdeaWorks version ends up being less expensive. Although Air Hawk is not as efficient as a Standard air compressor is. But its size, portability, and convenience probably make it a worth buy. After reading our Air Hawk review 2019 what do you think about this product? whether it is important for you or not. Please share your reviews in our comment section. Note : The Air Hawk's hose has been updated with an easy ¼ turn assembly and may be received with or without the red attachment lock. Inflates in 90 Seconds or Less!